many other fun things going on. It has been flattering getting messages and emails with interest to see more updates. 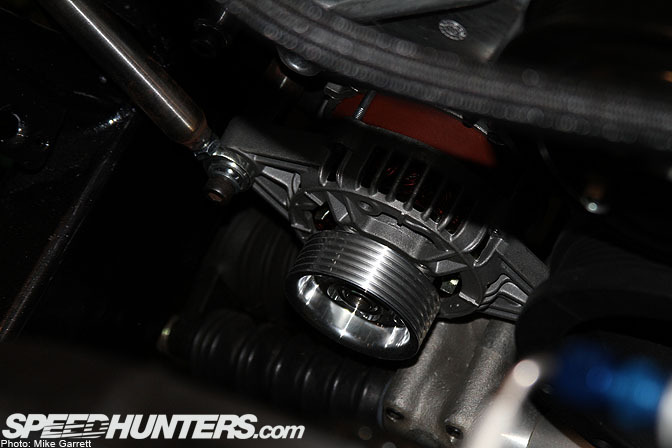 The love for the RTR-X that has been received both virtually and in-person are beyond all expectation. build. Seriously, thank you all for your time and involvement, it has been very exciting thus far and we haven't even fired it up! 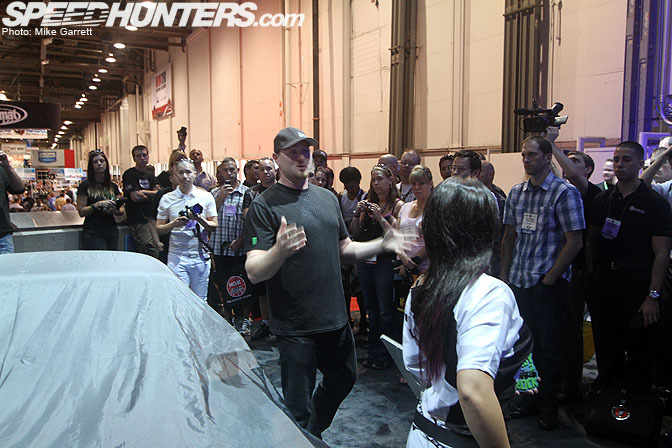 I'm not going to bore you with some of the fun we ran into just days before SEMA. 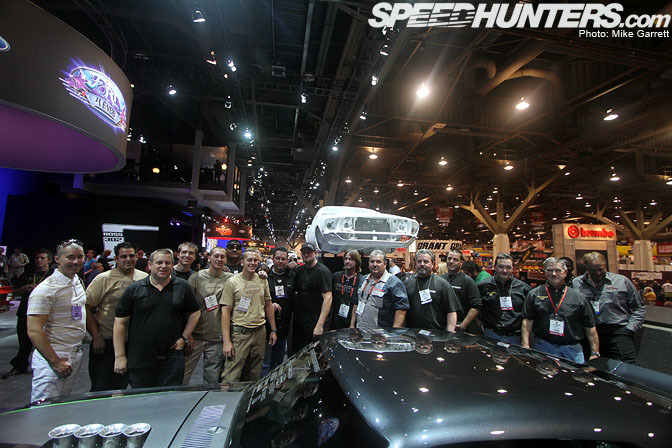 Let's just say that between the Twins, Steen Chassis, Stitchcraft Interiors, and yours truly, everyone went beyond burning the midnight oil to get the RTR-X to the Ford booth in time for the reveal on the opening day of. Pretty standard for a SEMA project right? The turnout for the reveal of the RTR-X was pretty overwhelming. The entire car was surrounded three to four people deep. Just prior to unveiling the RTR-X, I gave a speech off the cuff and from the heart explaining the project from start to finish. When I was done blabbing and Need for Speed girls Miki and Vanessa unveiled the RTR-X for the first time, a loud applaud followed. It was just so surreal being at SEMA in the Ford booth surrounded by a bunch of car enthusiasts, thousands of amazing cars, and unveiling this project that the entire team has put so much passion into. I know this picture was posted already, but I figured you might want to see the smiling faces behind the RTR-X again. The day following the reveal we had a special invite-only driving session of the RTR-X in Need For Speed's Shift 2 Unleashed coming this spring. The experience of driving the RTR-X in Shift Unleashed is really incredible. I cannot wait for the world to get their hands on it! Here is a screen shot; as you can see the modeling team was able to get the car perfectly replicated. It even goes back to its original form just by pressing restart after you destroy it in the game smashing stuff! 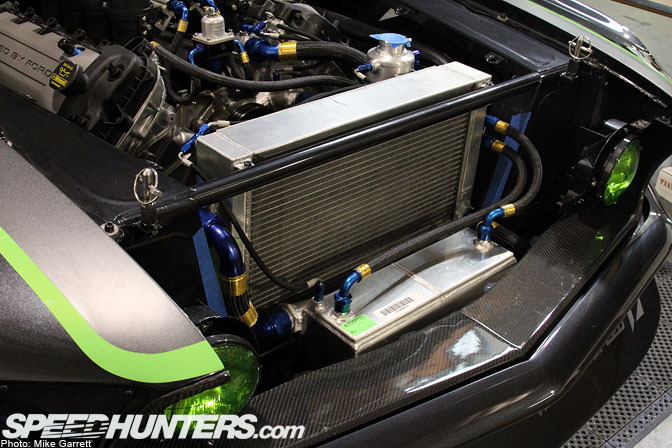 The car B-lined to Twins Turbo after SEMA for the finishing touches. Plumbing, wiring, exhaust, and some fab work. The car looked the part for SEMA, but definitely was not ready to hit the track or the street. 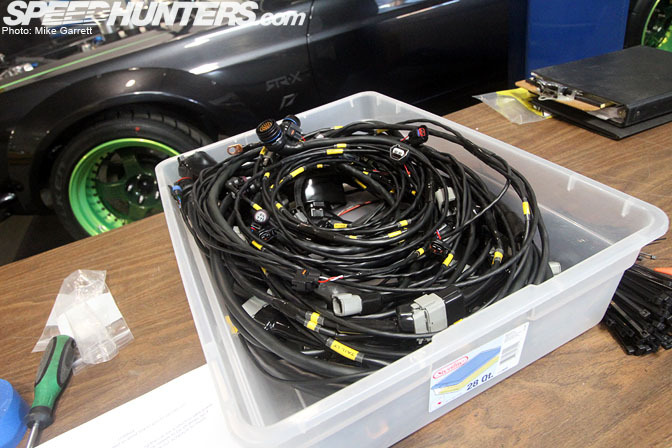 Nate from Motec was cool enough to hand-deliver the engine harness they made for the RTR-X. For those of you that don't know the Motec crew on both the east and west coast, they are amazing people to work with, as everyone knows they make the best ECU's and displays on the market. The wiring harnesses are no different. 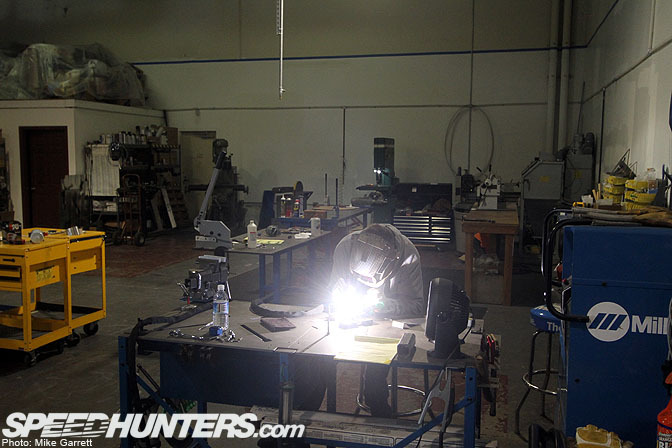 "G" from GP motorsports stopped by to measure up the chassis harness he is going to make for us. 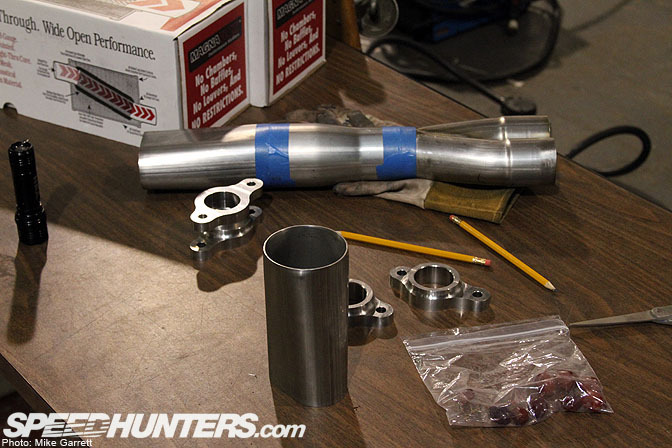 Here is Koz mocking up the exhaust. Koz doing what he does best having some fun welding. I would agree he kind of knows how to weld Text book beads right there. 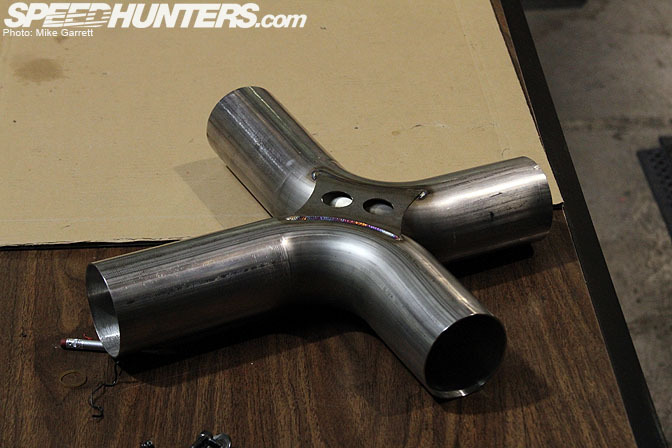 Here are a few of the custom header flanges the Twins had CNC'd and as you can see we are making the exaust out of oval stainless to get the best ground clearance possible. It's good to see the guys eating healthy! 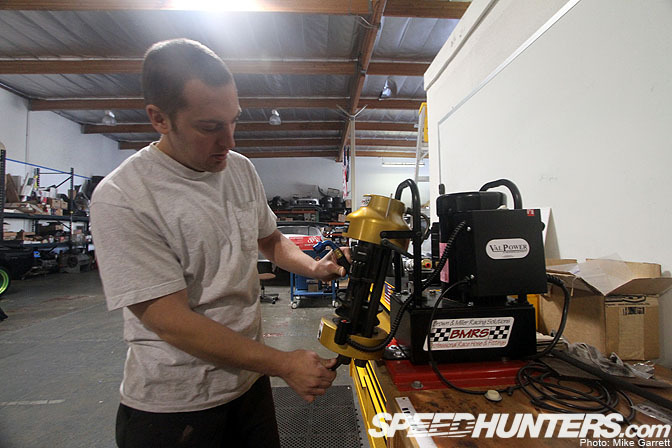 Grim is seen here making some plumbing using his sweet Brown and Miller Racing Solutions crimping machine. 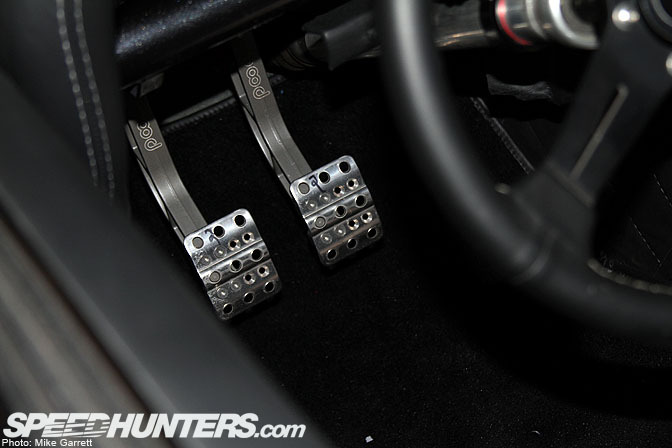 Once again… only the best for the RTR-X! Koz fabbed up up the mounts for our custom Griffin radiator and Griffin heat exchanger they made for us to our specs. 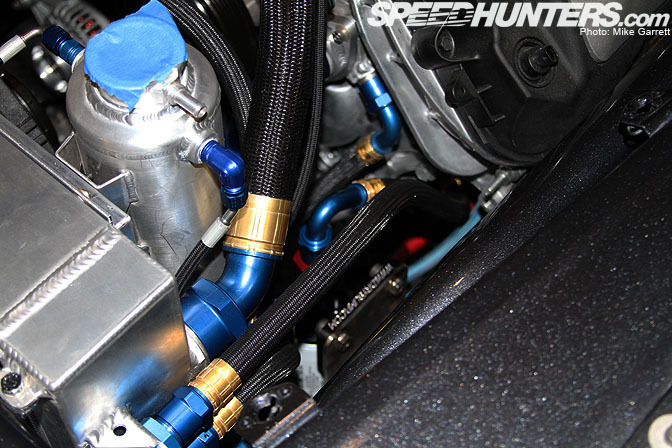 It looks so good plumbeed together with the Brown and Miller hose and fittings in the signature blue and gold colors. They might not match, but they will never ever leak or blow! Due to the relatively small size of the engine bay, we had to find a very small alternator; the Bosch ALRACE1 alternator was a no-brainer to use here. … blow a ton of Falken Tire smoke from back here!!! hoping for some action video soon. Fire up, dyno and so on. I am one jealous man Vaughn. I got to see this car in person at SEMA and was abit surprised at how good it looks in person. Its really low slung with a purposeful appearance that is a subtle mix of aggression and determination. I absolutely love it. 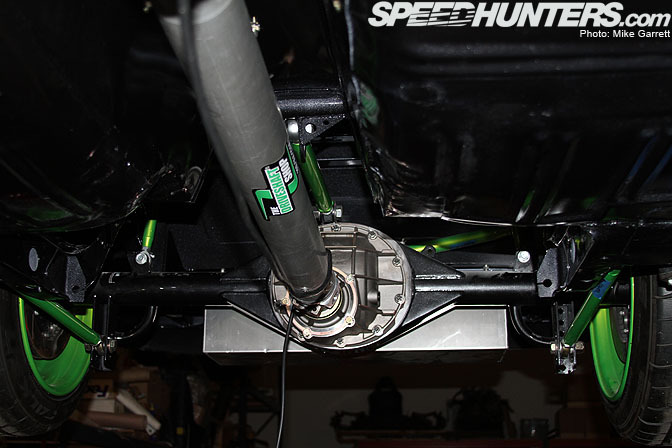 Cant wait to hear that thing screaming through those ITBs. NA is Best! Thanks for the update Vaughn! linhbergh... we need a freakin ton photo of this sh*t from you when it's finished. How do you expect to repair this car every event someone runs into you during tandem????? It doesn't seem very realistic to me..
Dude i hope u r filmong a video already?! cause i want to see it!! I must be honest, the NFS version is kind of off... it doesn't really look "perfectly" replicated. The fenders are quite off. Sounds like a good idea to me at least. 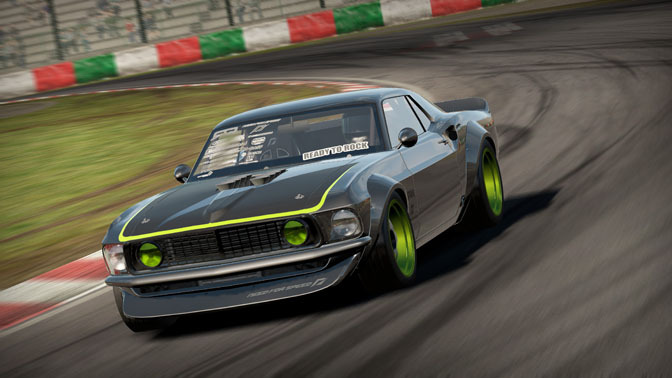 Alberto, it's so far from FD specs it's funny, this aint going to be a pro drift car, not even close to legal. It's a show car, great marketing for NFS and something Vaughn can go cruise in. 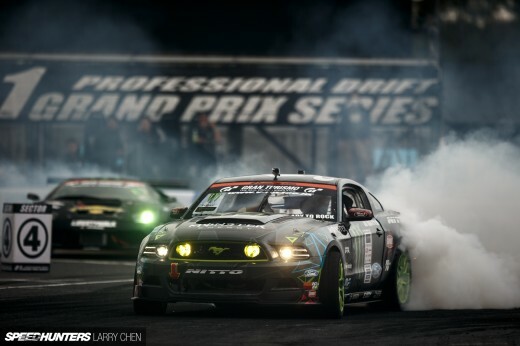 His office is a pro drift car, it takes a lot to top that, and I think he might have. This was NEVER his FD car. I asked him when just after it was announced earlier in the year. It will be a Street legal DEMO drift car. Nice work guys. Look forward to seeing it in person. twins turbo, you are amazing!